Corneal Implants Market size was valued at USD 334.6 million in 2018 and is expected to witness 6.7% CAGR from 2019 to 2025. Growing geriatric population susceptible to eye diseases will drive the industry growth. Moreover, technological advancements coupled with growing incidence of eye diseases on global level will further boost corneal implants industry growth. Presence of organizations such as Eye Bank Association of America (EBAA) and The Global Alliance of Eye Bank Associations to promote policies for encouraging effective corneal transplantation will render positive impact on business growth. Additionally, growing awareness regarding eye disease diagnosis should favour corneal implants industry growth over the forecast timeline. Furthermore, growing demand for minimally invasive surgical procedure across the globe will serve to be a positive impact rendering factor for business growth. Advantages associated with minimally invasive treatment coupled with growing awareness regarding corneal transplants that provide aesthetic benefits will boost industry growth. Advantages include sharper vision by the first day after surgical procedure, enhanced visual recovery and reduced risk of rejection. Such advantages drive patient preference for corneal implants thereby, fuels business growth. 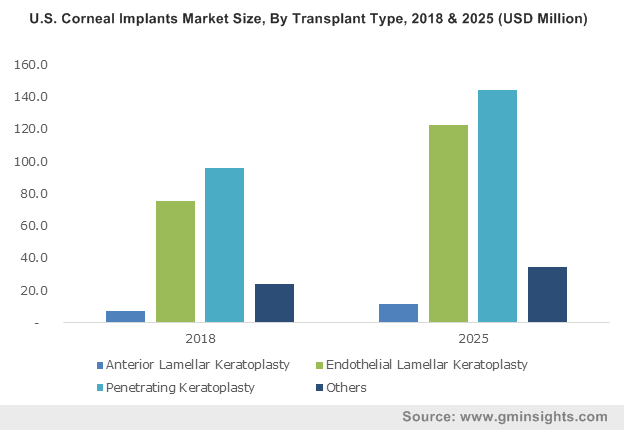 However, risks associated with corneal implants and shortage of donor material worldwide may impede corneal implants market growth over the forecast period. Human donor segment accounted for more than USD 300 million in 2018 and is poised to witness significant growth during the forthcoming years. Increasing awareness about eye tissue donation and corneal transplantation, especially in developed countries will favour segment growth. Reimbursement for donor tissue used in corneal surgical procedures will further favor segmental growth. However, rejection of donor cornea is main drawback that might pose negative impact on the segment growth. Artificial cornea segment is anticipated to witness lucrative 10.1% CAGR by 2025. Availability of superior quality corneal implants to overcome incompatibility issue associated with human donor cornea will foster business growth. High demand of artificial cornea in patients having high rejection rate for human cornea tissue transplants will further spur the segment size. Penetrating keratoplasty (PK) segment held more than 45% revenue share in 2018 and will show similar growth over the analysis timeline. PK is recognized as effective and safe method for corneal transplantation that should boost segmental growth. Furthermore, adoption of penetrating keratoplasty in the treatment of various corneal pathologies including keratoconus, bullous keratopathy and dystrophies will boost the segment growth. Anterior lamellar keratoplasty (ALK) segment accounted for considerable revenue share in 2018 and is projected to witness around 7.5% CAGR over the forecast period. Segment growth is attributable to surge in the number of ALK procedures worldwide. According to the Eye Bank Association of America, the number of corneal grafts utilized from the U.S. eye banks, for anterior lamellar keratoplasty procedures increased from 2,201 in 2015 to 2,386 in 2016. Increasing number of ALK procedures will thus, spur segment size during the forthcoming years. Fungal keratitis segment is estimated to show 6.5% CAGR over the analysis timeframe. Increasing prevalence of fungal keratitis in developing countries such as India and Bangladesh will augment segment growth. Moreover, risk of fungal keratitis is specifically high in patients in trauma and immunocompromised state. Improper or ineffective diagnosis and treatment may result in significant damage to the cornea, thus, bolstering the segment revenue. Fuchs’ dystrophy segment accounted for over 50% revenue share in 2018 and is projected to grow at significant rate during the analysis period. According to the Eye Bank Association of America, Fuchs’ dystrophy was the most common indication for keratoplasty in 2016, accounting for 23.3%. Rising incidence of the disease along with growing awareness among people regarding early disease diagnosis will thus increase the demand for effective and timely treatment thereby, fostering the segment growth. Hospital segment held momentous revenue share of around 45% in 2018 owing to availability of emergency facilities, well established healthcare infrastructure and presence of skilled healthcare professionals in hospital settings. Several government initiatives in developing regions to lower the cost of ophthalmic procedures taking place in hospitals will foster segment growth. Favourable reimbursement scenario to resolve the affordability issues in relatively lower income countries will surge segment growth during the analysis period. Ambulatory surgical centers segment was valued more than USD 135 million in 2018 and will show lucrative growth by 2025. Segment growth is attributed to rising reluctance to in-patient surgeries and demand for minimally invasive procedures. Patient preference towards effective treatment and concerns regarding hospital-acquired infections will further favour business growth in the foreseeable future. North America corneal implants market held more than 60% revenue share in 2018 and will show similar trend over the forecast timeframe. Regional growth is attributed to growing prevalence of diabetes in the region resulting in high risk of developing severe eye diseases. Moreover, availability of advanced technologies and healthcare infrastructure will positively influence the regional market growth. 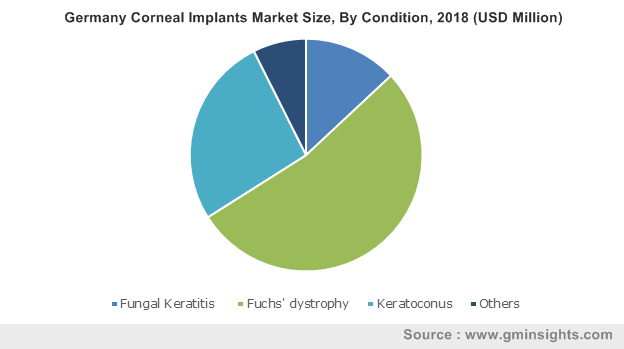 Strong foothold of key market players and eye banks in North America will further upsurge the corneal implants industry growth. 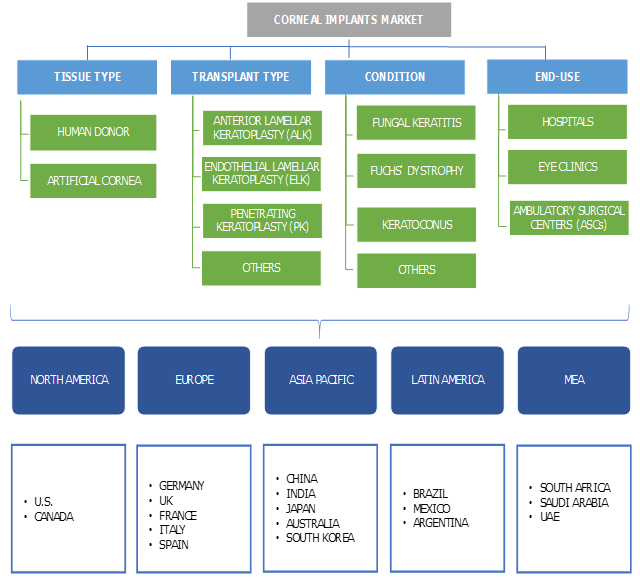 Asia Pacific corneal implants market is anticipated to witness around 8% CAGR during the forthcoming years. High growth can be attributed to rising number of corneal transplants in the region. Large patient pool in the region suffering from various eye diseases offer numerous growth opportunities to players operating in corneal implants market. 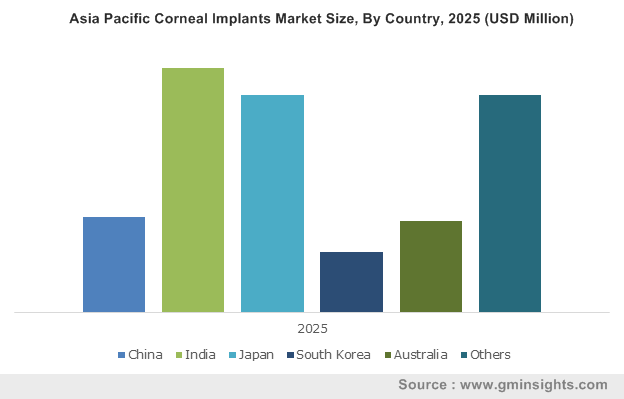 Moreover, various programs for efficient eye-banking skills organized by eye banks and other organizations will further drive Asia Pacific corneal implants industry growth over the coming years. Some of the key industry players operating in the corneal implants market include Alabama Eye Bank, Alcon, Florida Lions Eye Bank, Presbia, San Diego Eye Bank, CorNeat Vision, Aurolab, DIPOTEX, AJL Ophthalmic SA (Intacs), KeraMed and Massachusetts Eye and Ear. These players implement strategies such as merger, acquisition, partnerships and innovative product launch to capitalize on market opportunities and sustain market competition. For instance, in March 2019, Alcon acquired PowerVision, Inc., a U.S. based medical device company involved in development of fluid-based intraocular lens implants. This strategy aims to develop innovative and accommodating lens for cataract patients across the world. Progress in corneal transplantation was given stimulus by an epidemic of blinding Egyptian ophthalmia (trachoma) that emaciated Europe in the early 19th century. Corneal transplantation began holding roots in 1905, when Eduard Konrad Zirm, performed the first successful corneal transplant. In 1914, Anton Elschnig performed the second successful corneal transplant while studying pre-operative preparation and peri-operative infection. Later, Vladimir Filatov, Russian ophthalmologist, in 1920s and 1930s, refined lamellar keratoplasty and developed a new method for full thickness keratoplasty. A donor cornea from a cadaver was used for a penetrating keratoplasty in the 1930s. In 1944, the world’s first eye bank, the Eye-Bank for Sight Restoration, Inc., was established by Paton in New York. The eye bank aimed at designing a plan for the attaining, preserving and distributing eyes to corneal surgeons for transplantation procedures. The Committee on Eye-Banks in 1959, further recommended the creation of an ‘American Association of Affiliated Eye-Banks’. In October 1961, the Committee of Eye-Banks formed the Eye-Bank Association of America (EBAA). The EBAA was officially recognized as the eye banking sector of the AAO&O in 1977. It set standards for handling eye tissue, and to establish a training program for technicians. The EBAA Medical Standards were officially adopted in 1980, outlining specific contraindications for transplantable tissue, laboratory configuration, personnel requirements and standards of practice. With an impressive membership of 97 eye banks, nationally and internationally, the EBAA has facilitated restore sight restoration in more than 1,000,000 people and continues to dominate the eye banking community in corneal transplantation.